The figure 8 bend, also known as the Flemish bend, rewoven figure eight or a double figure eight bend, joins two ropes of roughly equal diameters together. Referred to in The Ashley Book of Knots, it is safe, easy to remember and tie. It should not be used in ropes that differ much in diameter for security reasons. 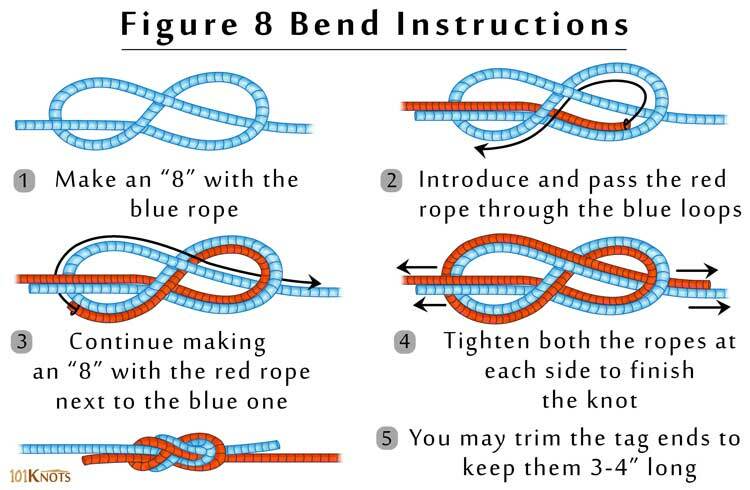 For heavy loads, it is important to dress the symmetrical figure of eight bend knot correctly and leave longer tag ends. On neatly dressing the knot, the two ropes remain parallel to each other at all points. Though some people secure the ends with stopper knots, that is not necessary if the knot is tied, stressed and dressed properly. However, when used in critical applications, it is best secured with double overhand knots at the ends. Tie it in the flat form as shown above to make minimum mistakes. Figure 8 follow through – It is a reliable way to attach the figure eight loop to a carabiner, harness or ring. 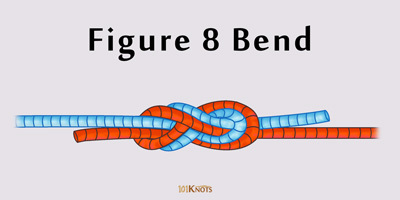 Figure 8 knot – The individual ropes consisting the above bend actually form a figure 8 knot tied in a reverse way to each other.